Wi-Fi hotspot access just got easier for high-speed Internet customers of Bright House Networks, Cablevision, Comcast, Cox Communications, and Time Warner Cable. The five cable giants announced an agreement Monday to make more than 50,000 hotspots in several U.S. cities available for free to each company’s customers. The new free Wi-Fi hotspots will operate under a new name called “CableWiFi” instead of using the separate names for each company’s hotspot networks. The new network brand is rolling out now, but it will take a few months to reach all the hotspots that are part of the new agreement. CableWiFi is already live in the New York City area and central Florida for Bright House and Cablevision hotspots. Free Wi-Fi hotspots will be available in New York City and the surrounding Tri-state area, Los Angeles, Tampa, Orlando, and Philadelphia. Other cities may also be added to the free Wi-Fi deal in the coming months. The new hotspot agreement should go a long way to helping alleviate the pain of mobile bandwidth caps that are the current trend among most major U.S. mobile device carriers. 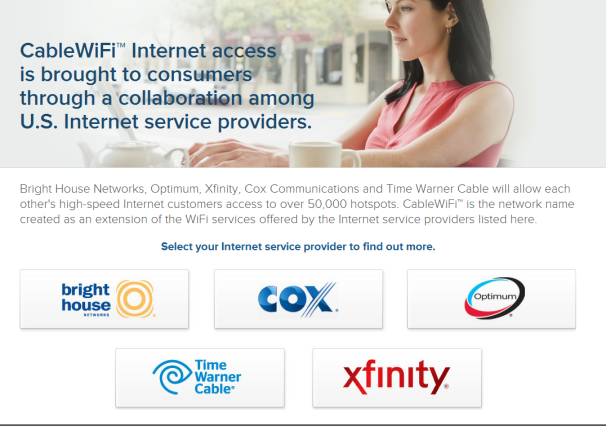 Users covered by the CableWiFi agreement will be able to grab free Wi-Fi at coffee shops, hotels, restaurants, and bars instead of using up their precious monthly data allotments from AT&T, T-Mobile, and Verizon. But with this ease of access may come new security problems for users. Make sure that CableWiFi access points are the genuine deal and not imitators looking to harvest data from your laptop. You should also try to use a virtual private network (VPN) whenever possible such as the free service HotSpot Shield from Anchor Free. And always sign-in to Webmail and social networking accounts using SSL encryption. For more tips check out PCWorld’s guide How To Stay Safe on Public Wi-Fi.